Welcome to 2008! I’m not sure if it’s my inner litigator telling me to avoid going on the record with things that can make me look foolish, my inner philosopher telling me that the calendar change from December to January is a pretty arbitrary construct, or my inner skeptic telling me that predictions are just parlor tricks, but for whatever reason, I’ve been reluctant to do the traditional blogger’s New Year’s predictions, so I put it off until now. That all said, I’m pretty immersed in this stuff at the moment, as I’m doing a comprehensive editing pass on Virtual Law (slated for publication in April) so predictions are dancing through my head like last week’s visions of sugar plums. Besides, I’ve got a mountain of paper here, and I want to put off working on New Year’s Day for a few more minutes. Toward that end, here are ten predictions for virtual law over the next year. 1. A major virtual world or game provider will be named in a class action lawsuit for failing to enforce its terms of service. 2. At least one country will block access to Second Life, citing content that violates local law. 3. The SEC or a foreign securities enforcement group will declare the sale of shares of virtual world companies for virtual currency an act covered by securities laws. 4. A virtual world featuring gambling will go online, with servers based in a gambling-friendly jurisdiction. 5. 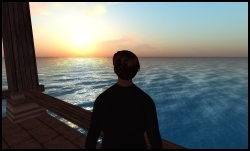 A state bar association will issue an ethics opinion on virtual world activity. 6. A congressional committee will investigate money laundering and terrorism-related activity in virtual worlds. 7. A virtual world’s chat log retention policy will spark resident protests. 8. The IRS or a foreign tax collection entity will issue a bulletin, notice, or written determination that income made in virtual worlds is taxable. 9. There will be a lawsuit between virtual world users claiming breach of contract and fraud. 10. A free-form virtual world featuring a true currency (e.g. the provider accepts liability for outstanding currency) will be announced. Agree? Disagree? Think I’m completely nuts? Add your own to the comments, and I’ll credit any that you nail in posts next year. I’ll look back at 2007 and wax nostalgic later in January, when VB celebrates its first year anniversary, but for now, I do want to briefly thank all of VB’s readers for giving me and the other VB writers your attention over the last year. Editing VB has been a lot of work — much more than I imagined — but also an enormous amount of fun. I can’t wait to see what happens next. Why are predictions always negative? How about a predicting another year free of real life law within virtual worlds? Evidence depicting avatars together, in either still photos, machinema, recorded chats, and/or voice chats will be offered by the state against a criminal defendant in a state murder trial. No. 2: I doubt that is possible to enforce, so I will disagree with that prediction. No. 5 is possible and likely if lawyers try to find clients in-world with real world legal issues. No. 8 I disagree, however, I think the money is already taxable once you convert it from Lindens to real world currency. Still, I think you could also offest that by your business expenses. No. 9…most certainly, but the suit won’t be worth the money it costs to litigate it. Have a great year Ben and keep up the great work! I agree with most of your predictions, mainly because it seems to me (a person with no legal background, US or otherwise) that only predictions 3. and 10. are remotely daring ; everything else has been budding in 2007. At worst, you’ll be off by a year on those. Which does not make the round-up less shrewd :). Have a good year ! I’m not sure when they will get to do a written notice but for Australian tax residents who are also virtual world residents once they pass the classic hobby – ‘carrying on a business’ test on the carrying on a business test side, then they will have taxable income in Australia. I don’t think the ATO would issue on this particular issue but it is a possibility. I think Julynn is spot on the derivation of income point would make for an interesting ruling and maybe other tax authorities will get there this year. I have thought of the currency conversion point too, but Julynn how would that work with expenses, and therefore deductions? Hey Ben Happy New Years to you. By the way did you catch the story about Second Life’s missing $700k in a ponzi scam? It was on Slashdot today, and I remember you guys writing stuff about Second Life alot. Tech Review Article that Slashdot links to. Thanks for the link, Mitch. I hadn’t seen that one yet. I’ll have to read it, as I remember giving Talbot an interview for it a month or so ago. MIT’s Technology Review has been covering the Ginko mess fairly comprehensively; I think this is their second major piece on it. I think the total actual lost out of pocket was more like $200,000 — most of the rest of the figure was interest that the people behind Ginko had added to people’s accounts but never had the ability to pay in the first place — but $200,000 is still a lot of money. Generally plausible, although I’m somewhat sceptical of no. 10. Not impossible, though. Happy new year! on 07 Jan 2008 at 10:38 am9 UgoTrade » Blog Archive » Interoperability for Virtual Worlds in 2008? Keep up the good work, I love this blog! Although not a lawyer myself, it was nice to see your top 5 fumbles, and this list, echo what I have postulated in the SL Exchange forums. One are I’d like to see comment on is the area of “buying” land in SL. There’s a distibnction between mainland, “owned” by Linden Lab, and islands “owned” by the estate owner. These latter are effectively leases, and some are treated like that, just token payments for the land are required (due to technical limitations in the “game”) but many charge the full going rate for it (purchase rate, plus of course then paying monthly tier and profit on top), and then change the covenant at the slightest whim, and claim a breach, and reclaim the land without refund. This smacks to me of mis-selling at the very least, deliberate fraud in many cases, and would seem to run counter to contract law which surely would be based on the covenant at signing time, with very little option to change that willy nilly (except to comply with law).